How To Recognize a False Teacher | Joe Quatrone, Jr.
What does this teacher say about Jesus? Beware of anyone who denies Jesus is equal with God, who downplays Jesus’ sacrificial death, or who rejects Jesus’ humanity: “Who is the liar? It is the man who denies that Jesus is the Christ. Such a man is the antichrist—he denies the Father and the Son” (1 Jn. 2:22). 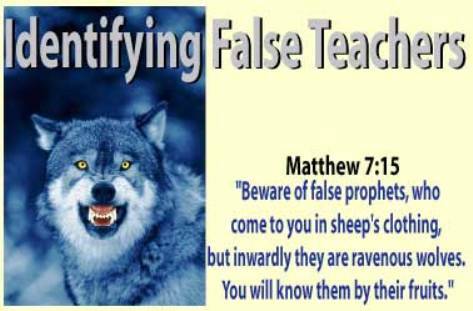 False teachers are often people-pleasers (Gal. 1:10; 1 Thess. 2:1-4). They preach more to please the ear than to profit the heart. But no one, not even a great preacher, has the right to change the message God gave us: “If anybody is preaching to you a gospel other than what you accepted, let him be eternally condemned” (Gal. 1:9). False teachers strive more to win over men to their opinions, than to better their souls. They busy themselves most about men’s heads: “Then the Lord said to me, ‘The prophets are prophesying lies in my name. I have not sent them or appointed them or spoken to them. They are prophesying to you false visions, divinations, idolatries, and the delusions of their own minds” (Jer. 14:14). Does this teacher exhibit character qualities that glorify the Lord? Referring to false teachers, Jude 11 says, “Woe to them! They have taken the way of Cain; they have rushed for profit into Balaam’s error; they have been destroyed in Korah’s rebellion.” A false teacher can be known by his pride (Cain’s rejection of God’s plan), greed (Balaam’s prophesying for money), and rebellion (Korah’s promotion of himself over Moses). Jesus said to beware of such people and we would know them by their fruits (Mt. 7:15-20). It is often difficult to spot a false teacher. Satan masquerades as an angel of light (2 Cor. 11:14) and his ministers masquerade as servants of righteousness (2 Cor. 11:15). Only by being thoroughly familiar with the truth will we be able to recognize a counterfeit. For further study about false teachers, review those books of the Bible that were written specifically to combat false teaching within the church: Galatians, Colossians, 1 Timothy, 2 Timothy, Titus, 2 Peter, 1 John, 2 John, and Jude. This entry was posted in Topical and tagged Antichrist, Christian, Church, Deception, Devotions, False Prophet, False Teachers, Gospel, Satan. Bookmark the permalink. You r so welcome. I have missed a lot of your posts. We have been in transition, all summer. LOL. I will catch up. Great word, thank you for your posts. Thanks Gail. Hope your transition (new house?) has been good. God bless! Great reminder to examine what we hear. Some of these false prophets can be quite charismatic so we must keep our heads and hearts about us. Indeed Janna. We must examine what we hear. It is easy to be led astray if we don’t. God bless! Good job. Will be recommending this article to friends.